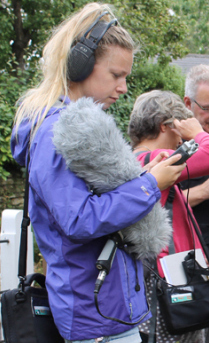 My inspiration for teaching kids about sound recording came from a Ridgeway Seasonal Sound Walk that I went on last summer, organised by Mandy and David at DIVAcontemporary. I was visiting from Australia so took my mum and sister along with me. We walked from Portesham to Hardy’s Monument, stopping along the way to record the sounds of our surroundings in the beautiful countryside with views of the ocean. We learned about the historical sites and plants with archaeology guide Victoria Pirie. It was a perfect time to enjoy nature and capture moments together with a microphone, instead of a camera. click to read Gabrielle’s profile page. This entry was posted in associate artist, audio, David Rogers, Gabrielle Fry, Mandy Rathbone, partnerships, sound walk, soundscape, Victoria Pirie, visual, working with young people. Bookmark the permalink.